Take your home interiors on a creative journey as I show you how to create an Indian-themed bathroom. As the old saying goes, the world is getting smaller. These days, travelling the globe and holidaying in far-flung places is easier than ever before. The things we see and experience can influence us in a number of ways, not least decorating and furnishing our homes. 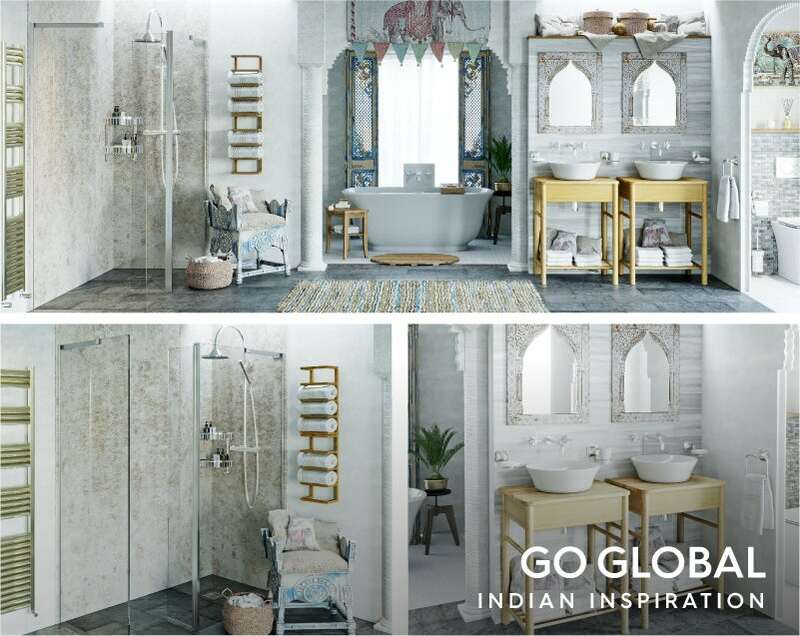 In our latest “Get the look” style guides, we’ve taken inspiration from India, Mexico and the Middle East, to serve up 3 distinct bathroom designs, influenced by the architecture, colours, patterns and materials used in those regions. I’ll demonstrate some neat tips and tricks to help you create your favourite global design, no matter how big or small your bathroom may be. 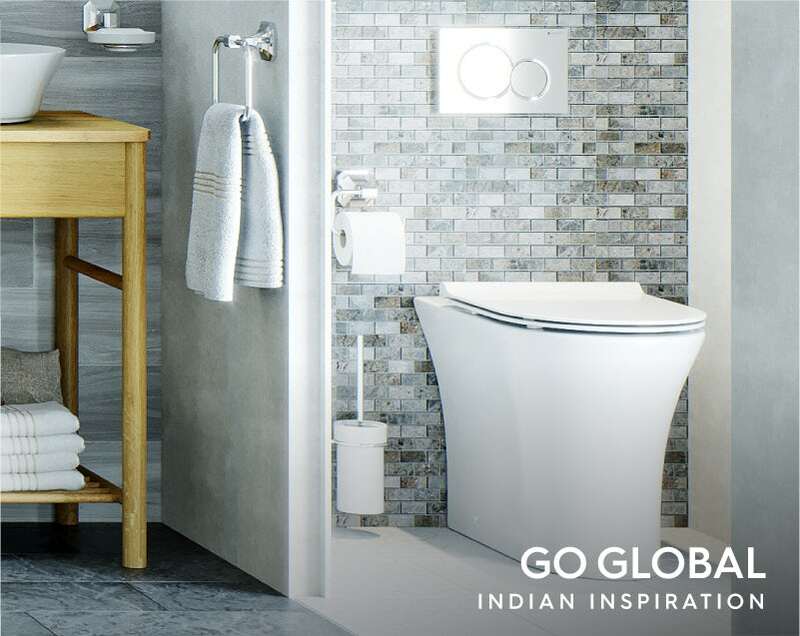 We kick off our journey of discovery with our Indian-inspired bathroom. India is such a large, diverse country, with each region having a distinct character and culture. However, you can still capture the exotic and enchanting nature of the sub-continent by following my tips below. 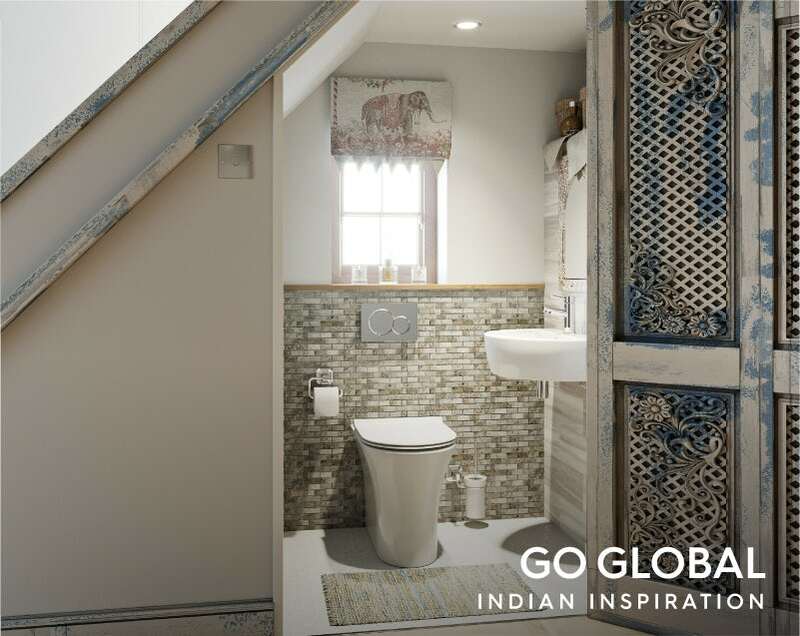 The first things you're likely to notice about our bathroom design are the shapes and decorative elements which feature heavily in traditional Indian architecture. If you're the type of person who likes to try their hand at DIY, you could create your own wooden borders to fit around regular-shaped mirrors. The colour scheme is quite neutral, featuring plenty of earthy tones, including greys, browns and shades of beige. In hotter climates, as you would find in India, stone is used extensively to keep floors and walls feeling cool. However, if you are looking to keep costs down, stone effect tiles and shower wall panels are excellent substitutes. To add a more natural feel, light wood finishes have been interspersed throughout, with washstands, a towel rack, bath bridge and storage stool. There is also plenty of space to add personalisation in the form of Indian motifs, patterns and accessories. India is famous for its fabrics (the national flag features a spinning wheel) and you'll no doubt want to show off any keepsakes you picked up whilst visiting the sub-continent. 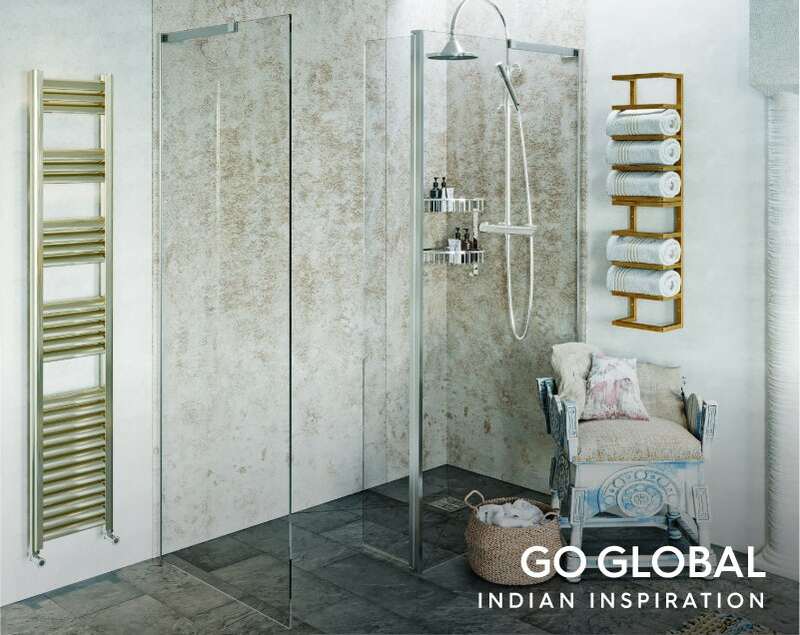 Let's take a look at the different elements of our Indian-inspired bathroom in greater detail. For a luxurious feel, we decided to carry the grey stone-effect tiles right into the shower area, creating a step-free wet room enclosure. The frameless and tray-less design really gives a spacious and open-plan feel to this bathroom. 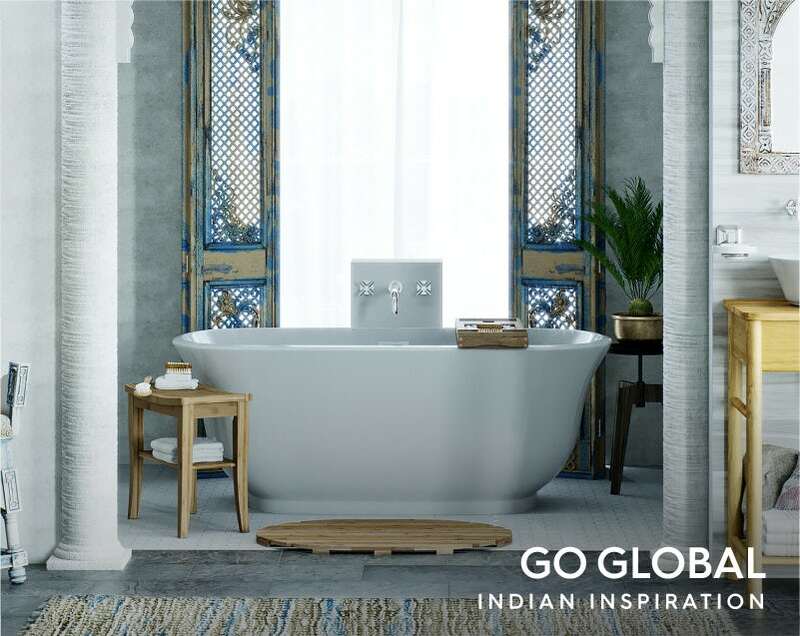 The gorgeous curves of the traditional bath fit perfectly with the Indian theme, giving you a truly awe-inspiring place to unwind, soak and reflect upon your travels. Indian interiors are often characterised by more informal spaces, where families and friends can relax and interact. We've attempted to replicate this by installing twin washstands with countertop basins. This allows you and other family members to prepare for the day ahead—a far more social experience. The wood finish adds a touch of warmth to your room. We added a separate toilet space to our bathroom design, with a decoratively arched doorway. The back to wall toilet design is highly contemporary, using a false wall and concealed cistern. It also comes with a slimline seat for a minimalist appearance. You don't need a massive space to create your favourite designs. An understairs cloakroom can be easily transformed into a durbar-inspired delight, with the right choice of décor and suite. A neutral colour scheme and a fabulous screen door enhance the look, whilst Indian-influenced keepsakes and motifs create a stunning small space. 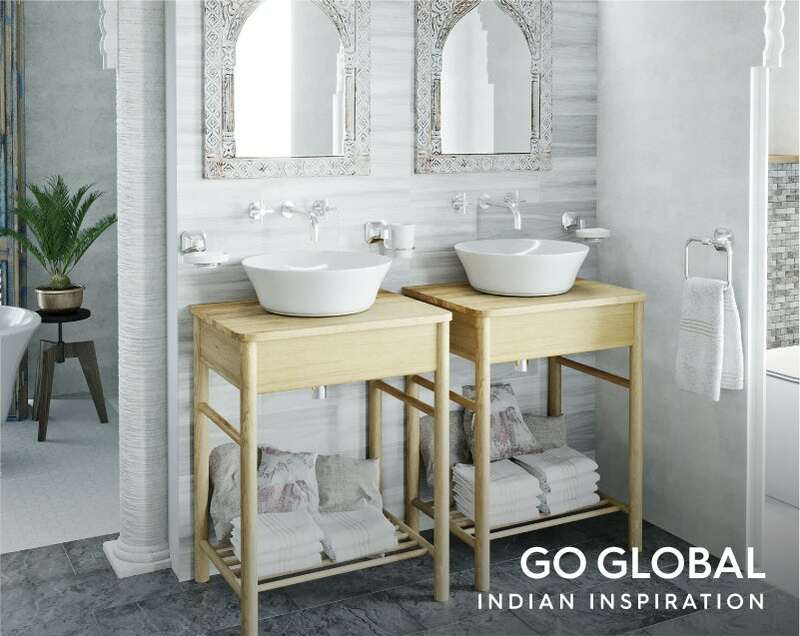 I hope you enjoyed this style guide and have been inspired to "Go Global" with your bathroom space. Next on this tour of the world, I'll be showing you how to create bathrooms inspired by Mexico and the Middle East. Why not join me by clicking on the images below. Go on… be adventurous. With our summer set to be one of the hottest on record, we’ve turned to one of the hottest areas in the world for our interior design inspiration. 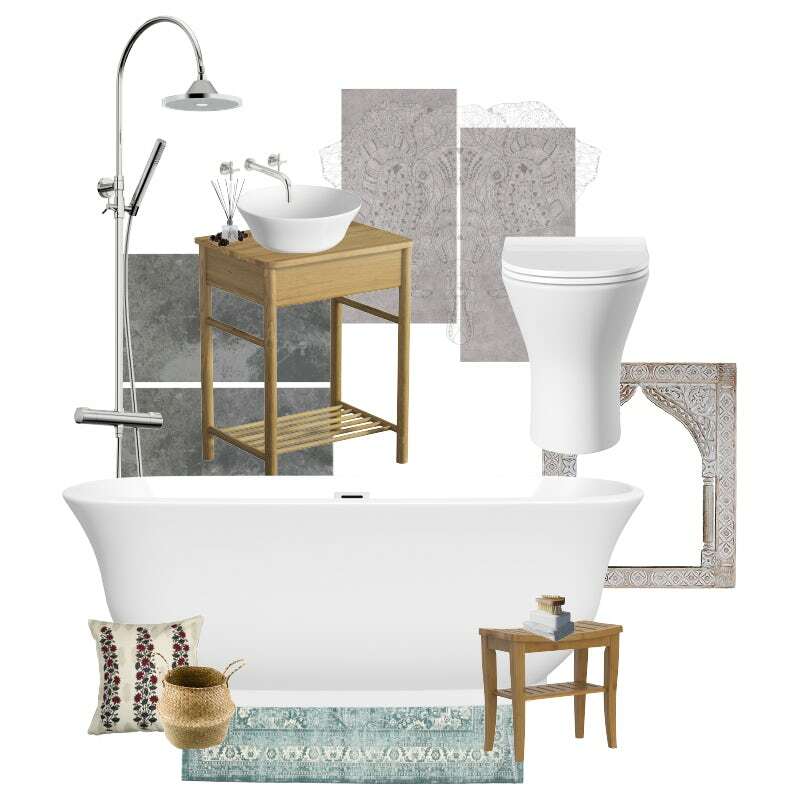 Taking influences from across North Africa and the Middle East, we'll show you how to create an Arabian style bathroom that's full of Eastern promise.